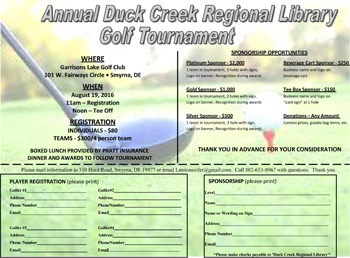 We hope you’ll join us at this fun event! Join s for our 2nd Annual "Just Ducky Festival"
• Face Painting, Corn Hole games, Dunk Tank, and more! Shoppers will delight in the art, craft, and yard-sale vendors! 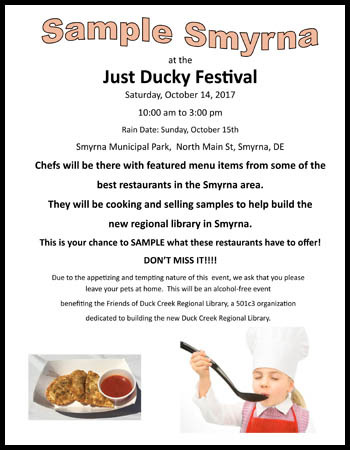 Chefs will be there with featured menu items from some of the best restaurants in the Smyrna area. They will be cooking and selling smaples to help build the new regional library in Smyrna. Due to the appetizing and tempting nature of this event, we ask that you please leave your pets at home.